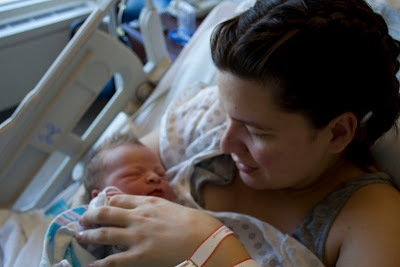 The (really, really) long version continued: Part 1 HERE *If you don’t want all the labor details about the epidural and lack of progress start at the astriks at 1PM. We got to labor and delivery around 2:30 and I was taken to triage. 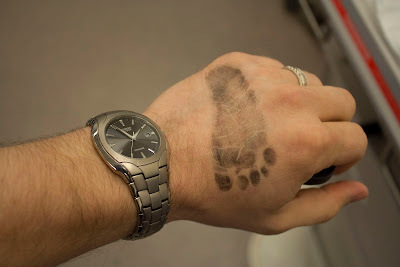 I was not so fond of the nurse who was in charge of checking me in. She wasn’t friendly and she kept asking me questions while I was unable to talk, hello contraction, and then would keep asking until I answered. Needless to say I snapped at her from the pain and then she was all like “well that is an unnecessary tone.” I apologized, but really don’t think I needed to. Rob was too stressed out by my pain to remember to answer the questions – like “do you want an epidural” or “how long have you been in labor” – for me, hence the snapping I was then put on the monitors and checked. 90% effaced, -2 station, 5 cm dilated. Woo hoo! I’m halfway there or something. 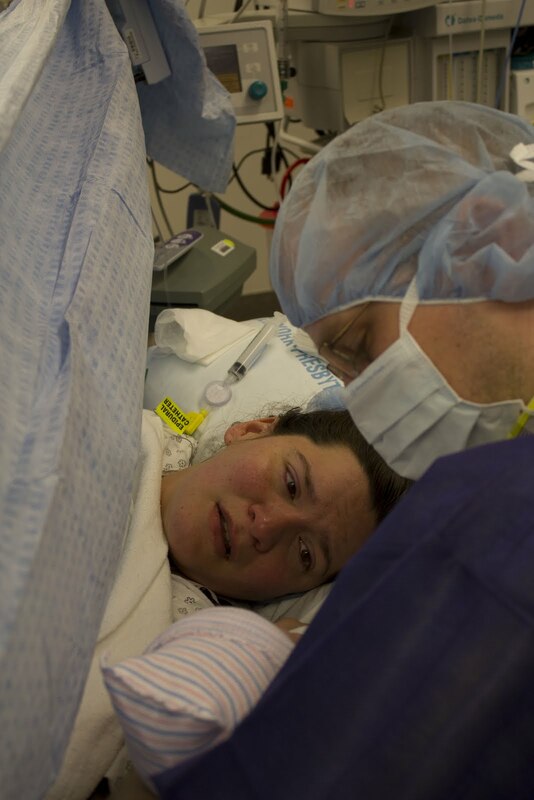 At this point I was still committed to my epidural free birth. It was a very busy night in labor and delivery, so I was in triage until a little after 5am. In this time they never came to take me off the monitors so I couldn’t move. Not that the cramps would have allowed for much of that anyhow. The nurse also came in to put in my IV. This was during a moment of high pain, so I wasn’t with it enough to say hep lock only. Rob was in a chair across the room. He could get a little closer but not too much because of all the machines. At some point I was in pain, and Rob wasn’t able to help me and I couldn’t move and I started to think the epidural wasn’t such a bad idea. (**I really don’t know if some of these things were different if I would have made a different decision or not regarding the epidural) At 5 when the nurse came to tell me my room was almost ready. I said I was thinking maybe an epidural, they took this to mean call the anesthesiologist right now. On my way to the room the nurse grabbed me around the waist, to help me walk I guess, and I snapped don’t touch me. Again she was offended, but she didn’t ask or say anything, and if someone was going to help me I would prefer it be Rob and I really didn’t want anyone touching me at that point. When I got to the room the anesthesiologist was waiting. I was ok with it and ready but if you aren’t sure don’t say you are thinking about it. My justification to myself for the epidural was I can’t move around anyhow, so I might as well not move and be comfortable. And I was exhausted as I had been in labor and constant (no breaks between contractions) for 11 hours. When asked for my pain scale the contractions were around an 8 and the breaks a 4 or 5. 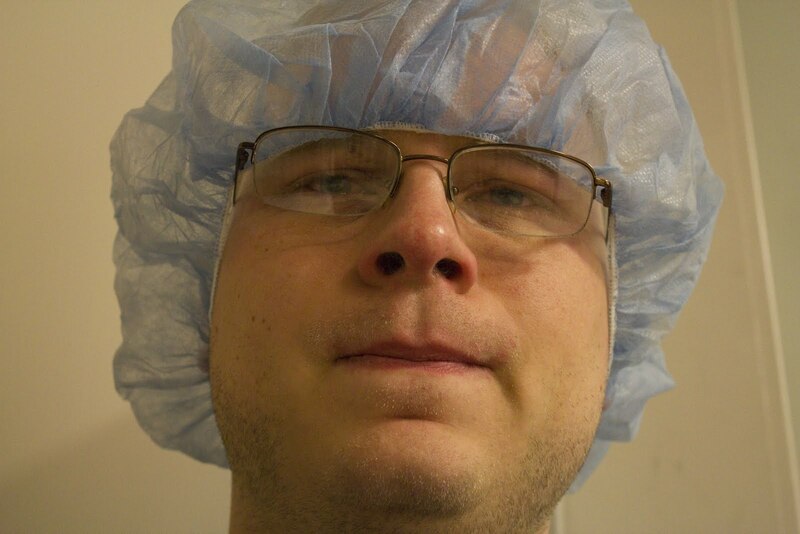 The epidural went in fine, it’s probably best that policy is Rob had to wait in the hall. I did have a very nice med student who wanted to observe and she held my hands. The hardest part of this was sitting upright and still as it went in. As soon as it took I had an absence of pain between contractions. 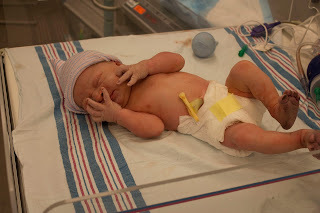 During this time I stayed on the lowest dose with no “booster” drug because I did still want to feel the contractions. But I was finally able to rest. And even sleep a little. Rob however, was in an upright chair again. I should also point out that due to heat and watching too much Netflix we had both only slept about 3 hours on Thursday night and had now been awake all night Friday night. When the shift changed at 7:30 and my new nurse came in, I was actually smiling feeling pretty refreshed for all the catnaps. Rob was looking pretty rough and the first thing the nurse did was go find him a recliner. I told Rob to call my parents and let them know we were at the hospital (funny story in itself) and then to sleep for awhile. The nurse gave him a blanket and he kind of did. My doctor, Dr. S was on L & D for the weekend. So she came in at 8 and checked me again. 5 cm! At this point I was super glad of the epidural because if I had been in labor with lots of pain for 5 additional hours and knew I hadn’t progressed I would have been pretty stressed. Dr. S broke my water and there were meconium in the fluid. She wasn’t worried but said we’d have to check the baby when he came out. The also gave me an internal contraction monitor. At 11 Dr. S checked me again. 7cm. I had progressed, but slower than they would like. They like to see 1cm/hour. Dr. S said to go another hour and then maybe give me pitocin to speed things along. I was ok with this and Rob and I chatted and I was feeling pretty good. At noon I was starting to have back labor. At this point I figured if I had an epidural, I might as well have the epidural and asked for another dose. Dr. S said to hold on though because maybe I was ready to push. No progress. And the baby’s heart rate had not been recovering super well from the decels. (*If I had not had the epidural I would have asked for not constant monitors, so this may or may not have been a factor). I got the booster dose of epidural. Then Dr. S gave me an internal heart rate monitor for the baby and an oxygen mask for me. She also said no pitocen because that would possibly put the baby in distress and mentioned that if things didn’t start moving we’d think about a C-section. She’d come back in an hour. At 1 o’clock Dr. S came back. Still no progress. Ugh. She said C-section. And meant like right now. This is when Rob and I both got a little scared and choked up. I trust my doctor, and if she is saying this it needs to happen. But still, not what we wanted. I had been in the room for 8 hours and in labor for 19. She said most people would be parents by now. She didn’t know what the hold-up was but my cervix was starting to swell and he was possible too big. She didn’t want to wait, because it didn’t seem I would progress, and didn’t want to risk pitocin. She brought the paperwork I signed and then things started moving lightening fast. The nurse brought scrubs for Rob and started telling us about the prep. We were both teary and still processing. I asked for a few minutes. The nurse cleared the room. Rob and I both broke down sobbing. He sat on the bed and we hugged and were talking a little to comfort each other. I swear we got 90 seconds before the room was full again and everything was starting. 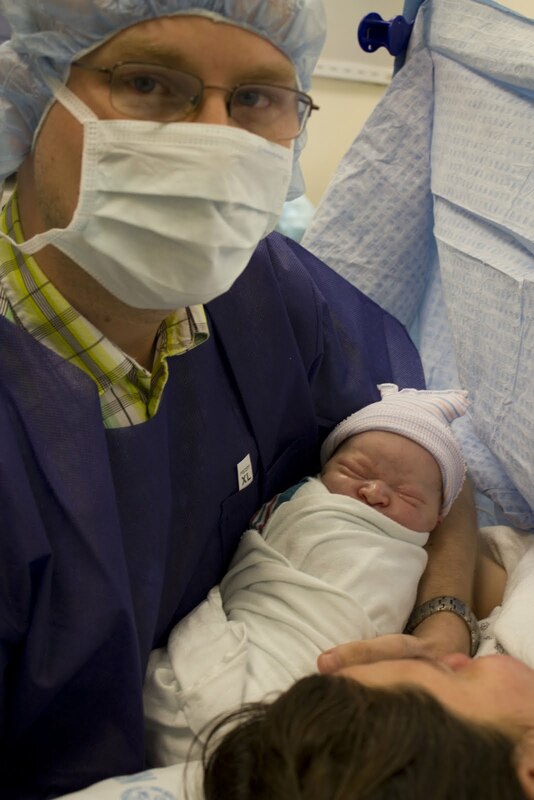 This was not enough time for either of us to really be ok with the C-section. Or enough time to stop crying uncontrollably. I was given more epidural, enough for surgery and they started prepping me. Rob went to the bathroom, I think to cry and wash his face, and THEY TOOK ME. I know Rob was going to have to wait outside until they were ready to start the surgery, but I didn’t want him coming out of the bathroom to find me gone either. I told them to have someone wait for him. I have no idea if anyone did, but he was directed to outside the OR, so I guess someone did. Through all of this I could not stop crying. I finally asked to take the oxygen mask off because I couldn’t breathe. I felt like it was suffocating me. I asked for a kleenex to blow my nose, the best they could do was a blanket, I have no idea whose bare hand I put the snot covered blanket in when I was done. I was trying to be all business, but I couldn’t stop crying. Hormones and drugs I blame it on. Oh, and I was still a little scared, and my husband was in a hallway somewhere. I got the sense the staff was used to that though because everyone in the OR was very calming and soothing and nice about it. Everyone also explained exactly what they were doing even though I couldn’t see or feel below my chest. I was also FREEZING. The epidural made my legs and upper back really cold, so they put pressure warming boots on. The extra saline made my arm cold, so extra warm blankets on my chest and arms. In addition to crying I now couldn’t stop shaking. I was worried I was going to shake to much for them to do the surgery, then I remembered I was numb and nothing down there was actually moving. Rob was brought in and he had the camera. His eyes were all red. 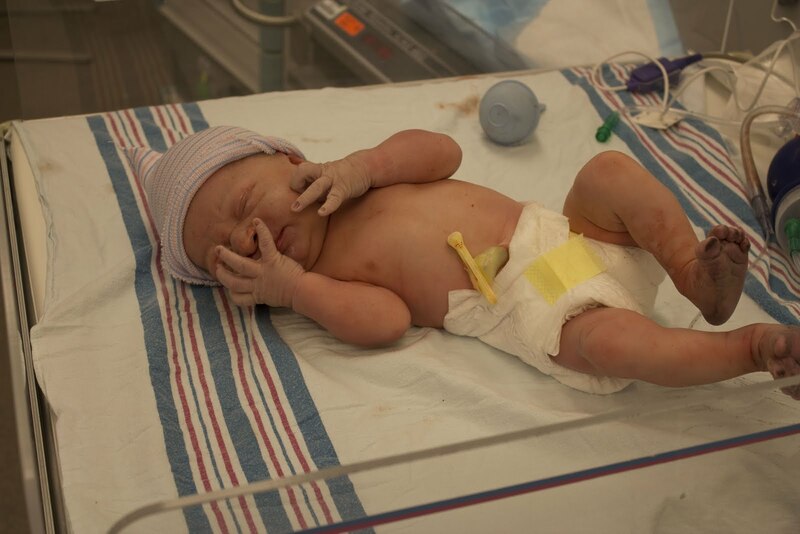 I told him “you have to hold it together from here on out because I’m not going to be able to” All of this happened within 15 minutes of being told we were having a C-section. I cried through the whole surgery. Getting Simon out was pretty quick. They started cutting at 1:21 and he was born at 1:41. The way he was turned and his size made it take a bit to get him out. I could feel the tugging and Dr. S talking about turning him. Once he came out he was given directly to the pediatrician. He wasn’t held up for me to see or brought over. He didn’t cry immediately, but within a few seconds. I don’t know what went on with Simon at this time, normal newborn stuff I suppose. When Rob went with him to the nursery they said they wanted to monitor his breathing and that this was common after a C-section. I do know that I was out of it enough Dr. S did not ask us his name. I sent Rob over to take pictures so I could see my baby. He took some pictures and came back to show me. The nurses called him back over to hold the baby after about 10 minutes and Rob brought him over to me. The nurses took our first family photos. We look rough in these pics. Raw emotion. I looked at them for the first time a month later and they made me teary. 1. Written checklist for Rob to look at both at home and in the hospital (remind K to drink water, ask every 30 minutes “what can i do”, answer to all hospital questions and THEN ANSWER FOR YOUR WIFE) If he can’t remember to answer then HAND THE LIST TO THE NURSE. 6. DO NOT sign consent forms for anything until you are actually ready. If you need a few minutes say so BEFORE not after you sign. Otherwise you get no time. The birth was traumatic, that’s really the only way I can describe it. But it’s been almost 7 weeks not, and the raw feeling is subsiding. 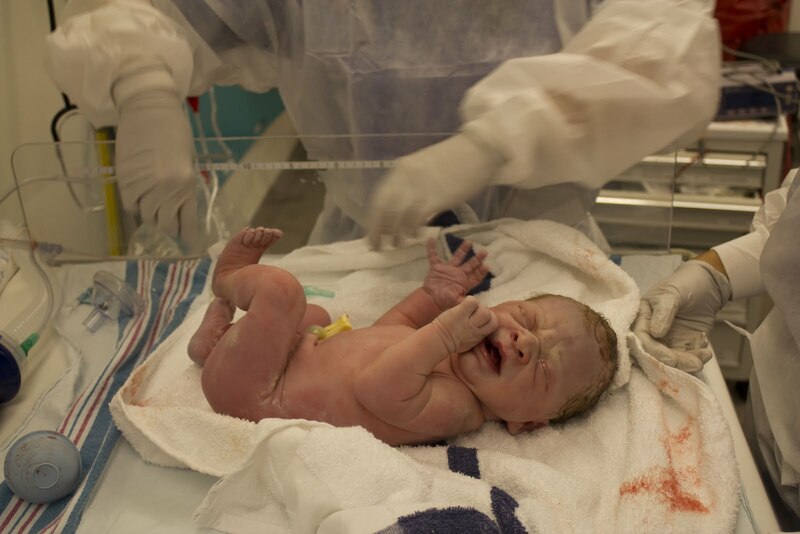 I have no regrets about having the C-section. I really feel it was the way he was going to get here. I would change a few things about the overall experience, see the list above, but I don’t feel like I was cheated out of a vaginal delivery. I was asked around 4 weeks if I would go though labor again, since I did for 19 hours and all, and I said yes without hesitating. This surprised me, because until that day I was seriously thinking I could be ok with one baby ever. But if I am lucky enough to have a second, I would go through labor and Dr. S said there is no reason I couldn’t have a VBAC. She said he was big, 7.5 pounds doesn’t sound that big, but maybe he was. He was also turned with his face 3/4 to the front, causing my back labor and making it hard to descend, I think this was the bigger problem, but that is just my opinion. I had already heard the story,but I still like reading it again. Emotional. Good to see "the other side". Those baby heads turned the wrong way make it much harder to push out (hence my pushing forever for a 6.5 lb baby). You did well. One important comment. WHEN you successfully VBAC, at least have an IV to put my mind at ease 🙂 Talk to you soon.